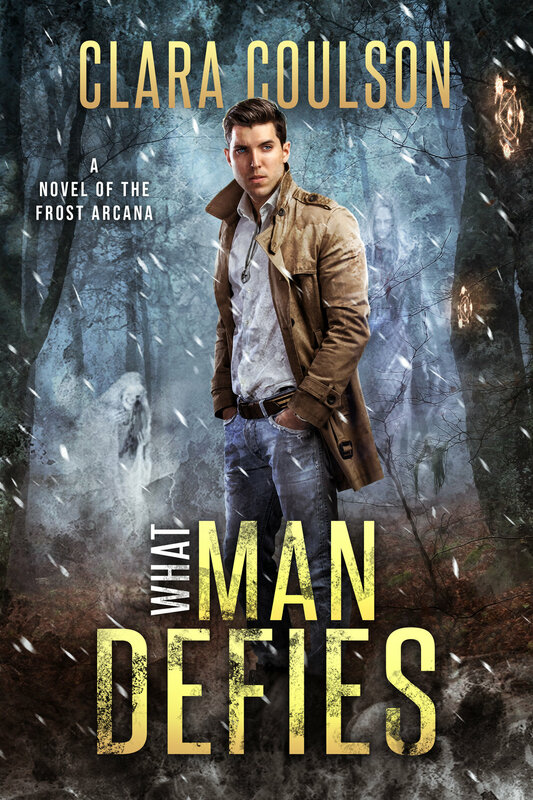 What Man Defies is Out! The second Frost Arcana novel is now available! Three weeks after his disastrous showdown with Abarta, Vincent Whelan is well on his way to recovering from the fight and putting the whole nightmare behind him. But when a standard stretch recovery job comes to an end with an angry ghost slinging heavy objects, Vince discovers a thread he left hanging has frayed beyond repair. For almost two months, random people in Kinsale have been mysteriously vanishing. Now their shades, damaged by terrible deaths, have begun to plague the city. Vince, spurred by the growing list of victims, goes on the hunt for the person or creature responsible for the kidnappings. Only to get more than he bargained for when one of his own friends gets snatched before his very eyes. In a race against time, Vince puts together a ragtag team to venture into the Otherworld and rescue the remaining victims before they all succumb to a horrible fate. But the path to victory is fraught with peril, and the mastermind at the end of the road may just be unbeatable. A vault protecting a powerful relic. Merciless enemies at every turn. And countless lives at risk. All Vince wanted was a little peace and quiet. Now he’s got the fate of the world resting in his hands. Again. What Gods Incite is Out!